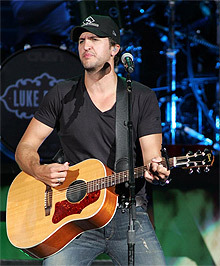 Luke Bryan burst onto the country music scene in 2007 with a down-home country style and relatable songs. The Georgia native paid his dues, performing and touring with well known country artists such as Jason Aldean, Rascal Flatts, and Tim McGraw, before taking on a award-winning, superstar status of his very own! On May 8, Luke Bryan Kicks off the 2015 Kick the Dust Up Tour in Grand Forks, ND and will ve playing 13 cities including Dallas, Denver, Chicago, Santa Clara to name just a few! Look for a dynamic, high-energy show you won’t soon forget! Tickets for the 2015 Kick the Dust Up Tour are on sale now. Order your Luke Bryan Tickets on line or by calling (855) 305-4862. Now playing Luke Bryan – Roller Coaster__AAC_128k – Copy.mp3 by !